This Guide argues that Eight Skills, practiced daily, are key to being a great performer. But skills alone are not enough for leadership. We must have good values as well. Recall that in Strengths-Based Leadership, Gallup offers us four core leadership skill domains, the first of which, Strategic Thinking, is a seeing (foresight) domain, and the next three of which are doing domains: execution, influence, and relating. We expand Gallup’s Strategic Thinking domain into the Four Foresight Skills: the first is a learning step (knowing the relevant past and present), which is foresight preparation, then Toffler and Amara’s Three Ps, the core types of foresight production. We then integrated Gallup’s three doing skills with the universal Do loop (Learn See Do Review cycle), described by Shewhart, Deming, Simon, Boyd, and other management scholars. That gives us the Four Action Skills: Execution, Influencing, Relating, and Reviewing. These are the Eight Skills of Adaptive Foresight. It is our contention that any fewer skills takes away something critical, ignoring the key management literature, and any more is unnecessary. These are the key skills we need to practice in our daily lives, and help others to practice as well. Skills of course are not value free. Leaders must also have vision, and they pursue goals, which are expressions of values. In an evolutionary and developmental universe, a subset of our goals and values will be particularly adaptive. What might those be? Evolutionary Values: Freedom, Creativity, Insight, Diversity, Empathy. Developmental Values: Order, Truth, Power, Security, Ethics. More Empathy (love, compassion, understanding, connectedness). More Ethics (morality, fairness, synergy, positive-sumness, interdependence). More Insight (dematerialization, virtualization, modeling, consciousness, intelligence). More Power (densification, wealth, speed, STEM compression (exponential production efficiency & density). More Diversity (information, individuation, specialization, difference, independence). More Security (awareness, protection, safety, risk management, immunity). More Freedom (bottom-upness, indeterminacy, options, uncertainty). More Order (top-downness, structure, regulation, constraint). More Creativity (unpredictability, novelty, imagination, fiction, experiment, innovation). More Truth (predictability, optimization, accuracy, inertia, sustainability). Leaders who learn about, measure, and use foresight to steer their teams and themselves toward these values, and who consciously balance them against each other, are going to be better leaders. Pursuing these skills and values for ourselves can be called Adaptive Self-Leadership, and pursuing them on our teams is Adaptive Leadership, which we discuss further in Chapter 5. As we’ll see shortly, we can arrange these ten values into three values sets, in a Three Ps model (see picture at right) which allows us to perceive three main ways our minds work to lead ourselves toward the future. 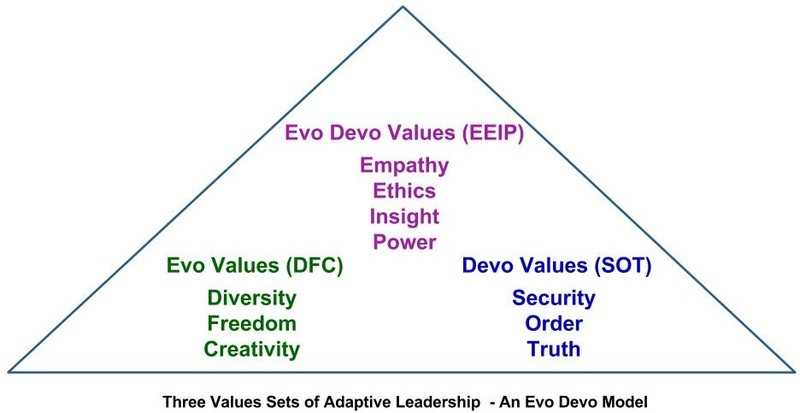 This is not a final evo devo-derived leadership model. But it’s good enough for us to begin to use and critique. Remember that these skills, values, and values sets are often in tension or competition with each other. We can’t practice, improve, or maximize all of them at the same time. So getting right balance among our skills and values, moment by moment is a matter of art and practice. But having the right models helps us pay attention to what matters in both the vision (goals, values) and work (skills) domains. 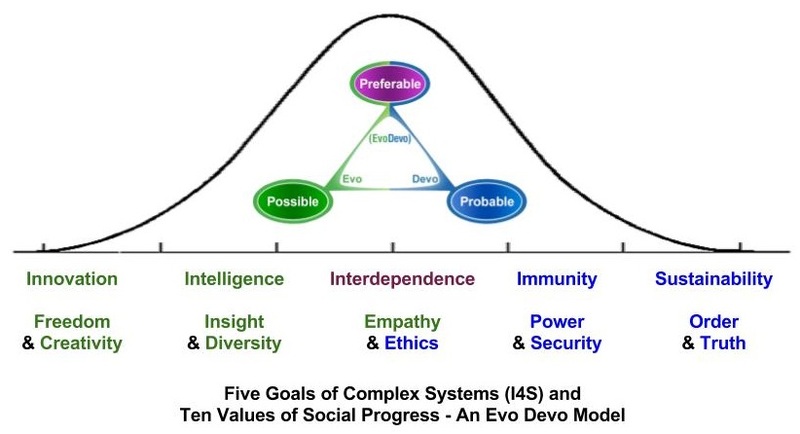 This Guide argues that empowerment (evo devo) foresight, the Five Goals, Ten Values, and Eight Skills, are the best complexity-based models we have today for knowing where to go (values, goals) and how to get there (skills). If you use any of these models, as I do in my own life, I believe they will clarify much, and take you very far. Again, we’ll say a bit more about Adaptive Leadership in Chapter 7, but we’ll leave a longer treatment of leadership for a later version of the Guide. In the meantime, lead thyself well and far, fellow foresighter!